Prince William Sound (Russian: Чугацкий залив Čugatski zaliv) is a sound of the Gulf of Alaska on the south coast of the U.S. state of Alaska. It is located on the east side of the Kenai Peninsula. Its largest port is Valdez, at the southern terminus of the Trans-Alaska Pipeline System. Other settlements on the sound, which contains numerous small islands, include Cordova and Whittier plus the Alaska native villages of Chenega and Tatitlek. 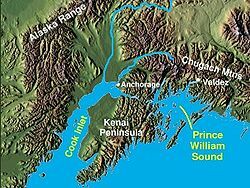 James Cook entered Prince William Sound in 1778 and initially named it Sandwich Sound, after his patron the Earl of Sandwich. Later that year, the Sound was named to honour George III's third son Prince William Henry, then aged 13 and serving as a midshipman in the Royal Navy. In 1989, the oil tanker Exxon Valdez ran aground on Bligh Reef after leaving Valdez, causing a large oil spill, which resulted in massive damage to the environment, including the killing of around 250,000 seabirds, nearly 3,000 sea otters, 300 harbour seals, 250 bald eagles and up to 22 killer whales.